If you really want to go to town with this pots-and-pans thing, you could probably buy a hundred different ones, each with its own specialized function. But is your kitchen really that big? You can do just about any cooking chore with some basic pots and pans However, if you want to take it to the next level, you may consider acquiring some of these additional handy pans. They aren’t essential, but they are pretty cool — and some of them even give you the opportunity to spout French to your guests. Who’s not impressed by that? A rondeau (pronounced ron-doe) is great to have on hand when you entertain — and of course you will! 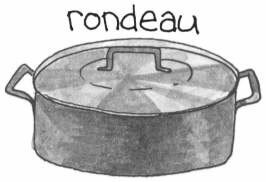 A straight-sided pot with two handles and a lid, a 12-inch rondeau can hold enough food to serve eight people or more. If you just got a raise (a whopper, that is), consider heavy-gauge copper. It’s so beautiful you may want to set it out on the front lawn when guests are coming for dinner. A rondeau has many uses, among them braising, stewing, and browning large quantities of meat, poultry, or fish. Look for brands like All-Clad, Calphalon, Cuisinart, Magnalite, Paderno, and Sitram. 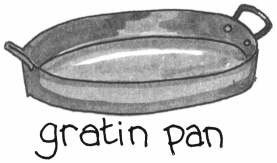 This Gallic mouthful refers to a little pan that is the workhorse of the French kitchen. If you ever splurge on a piece of copper cookware, try a sauteuse evasée (pronounced saw-tooz eh-va-say), which is 8 to 9 inches in diameter with a volume of about 3 quarts. A sauteuse evasée may be referred to as simply a saucepan, which is its major role. Its sloped sides (evasée refers to the sloped sides) make for easy whisking. A wok is a large, bowl-shaped pan with a rounded bottom that sits inside a disk that fits over your heat source. Woks work best over a gas flame, but you can still use them if you have an electric stove. In a wok, the very bottom gets super hot, while the sides are cooler, so woks cook meat and vegetables very quickly, leaving vegetables bright and crispy and meats crisp on the outside and tender on the inside. You can cook meat and vegetables in a stir-fry–like technique by using a sauté pan, but for authentically cooked Chinese food, use a wok (or go to a Chinese restaurant). A large, 8-quart stainless steel pot fitted with a lid is the perfect size for cooking 1/2 to 2 pounds of pasta (or you can use your stockpot instead). This flat, nonstick griddle is well suited for pancakes, grilled cheese sandwiches, bacon, and the like. Of course, you can always use the sauté pan for these chores. 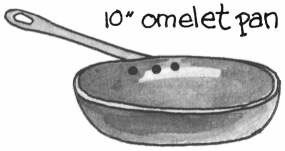 An 8- or 10-inch omelet pan is handy to have around if you love your eggs. It’s also handy for sautéing potatoes and other vegetables, but you can do any of these tasks in your go-to skillet, too. Novice cooks tend to make many one-pot dishes. To give these entrées a delicious finishing touch, often by broiling to crisp the top, you should have a gratin dish. Unlike Dutch ovens, gratin dishes are shallow, measure from 10 inches long and up, and don’t have a lid. A 12-inch dish can feed six or more people. These pans are ideal for macaroni and cheese, turkey casserole, gratin of potatoes, and many other simple dishes. Some are attractive enough to go from oven to table.